We’re gathering our aprons to support a great organization! Join Classic Remodeling at the Craftsmen & Craft Brews Lowcountry Boil, a part of the Masters of the Building Arts Festival hosted by the American College of the Building Arts. The Masters of the Building Arts Festival is a week-long event running from April 3-11 and features a series of professional workshops, hands-on demonstrations, lectures, tours and a variety of family activities. Craftsmen & Craft Brews Lowcountry Boil brings the festival to a close on Saturday, April 11. Join us from 5:00 to 8:00pm and enjoy a Lowcountry Boil with all the fixins’ - prepared and served by our very own Bob Fleming - with some help from the ACBA students. Kick back, tell stories, listen to live music, and taste our craft brews from Holy City Brewing or Tool Brewing. Tickets are $25 ($15 for students with a valid ID) and are on sale now. Proceeds from the Craftsmen & Craft Brews Lowcountry Boil benefit the student guild organization. Contact Ginna at 843-577-6283 to purchase your tickets today! For those who aren’t familiar with ACBA, it is the only school in the country to offer a four-year liberal arts bachelors degree where students learn traditional craftsmanship along with modern building trades. Charleston is our learning lab where students learn the “old ways’ and develop the skills needed to help preserve historic buildings not only here in Charleston, but around the world. We hope you’ll come out and enjoy this great event, and learn all that ACBA has to offer. This month, our project consultant Mary Todd shares some important information homeowners may not be aware of regarding FEMA flood zones and how they may affect your remodeling project. If you are thinking about tackling a remodeling project, whether in your current home or a newly purchased home, it’s easy to dream big. After all, the fun of remodeling is making the space perfect for you and your family. Unfortunately, in our area, there can be limits on what you are permitted to spend on your remodeling project, depending on which municipality you are located in and if your property is located in a FEMA Special Flood Hazard Area (SFHA). What is an SFHA and how do I know if my property is located in an SFHA zone? FEMA defines SFHAs as land areas that are at high risk for flooding, where high risk is defined as having at least a 1 in 4 chance of flooding during a 30-year mortgage. to you as part of your closing documents when purchasing your home. If your flood zone designation is “X” or “C” then you are not in a SFHA. If your flood zone designation is “A”, “AE”, “AH”, “AO”, or “AR” followed by a number, you are in a SFHA and your property may be subject to additional permitting restrictions. What does the number following the flood zone designation mean? Freeboard is a “safety factor” that individual jurisdictions can adopt, imposing more stringent height requirements than the FEMA mandated requirements. For example, Charleston now requires an additional 1’ of freeboard. Freeboard requirements differ based on municipality. How does flood zone, BFE, and freeboard affect my remodel? 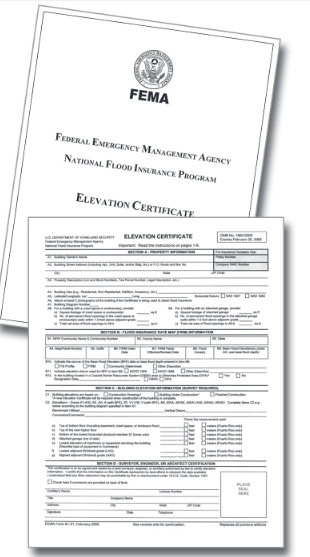 FEMA flood zone maps, FEMA requirements, and individual municipality requirements change regularly. 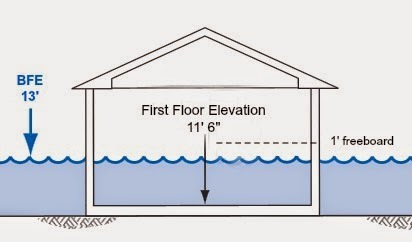 As a result the first floor of your home may fall below the Base Flood Elevation or below the freeboard requirement of your given municipality. If this is the case, you can only spend 50% of the value of your home’s structure (excluding the value of the land) on home improvements OR you must bring the home up to the current municipal code and FEMA guidelines (a.k.a. raise the home). A homeowner purchases a marsh front property in the City of Charleston for $800,000. The land is valued at $500,000 and the house is valued at $300,000. It is in an AE-13 flood zone. The first floor of the property is located at elevation 11’-6” (1’-6” below the BFE). In order to meet both the FEMA requirements and the city of Charleston’s freeboard requirements, the first floor needs to be at or above 14’ (AE-13 + 1’0” of freeboard). The homeowner can only permit a construction project worth $150,000 ($300,000 x 50%), without raising the first floor elevation. There is also a required reset period. The city of Charleston has a 5 year reset. With regard to the example above, the homeowner is limited to $150,000 over the course of 5 years. In Mount Pleasant, the time period is 10 years; each municipality varies. These are complicated issues for those who aren’t well-versed with the various rules and regulations that apply to properties located in SFHAs. There are also exceptions to every rule. Your best bet is to hire a contractor with experience working in flood zone restricted areas, who is familiar with various municipal codes, reset periods and qualifying exceptions in your region.